Contrar to what you would expect, it is not necessary for you to use charts from Forex brokers. Most people, out of comodity or lack of creativity, use the charting package of brokers. If you had to choose between a charting package and a broker, the first one may be the best choice. Of course having a broker is very important, especially one with enough NET assets which allow the easy liquidation of your account. However, you should make your decisions based on the charting package. For that you really need to know how to read them. Tools which you are going to use. Tools which will assist you in back-testing. “Alerting” tools for important things that you consider may help you, such as when price on the market hits the level that you were expecting just when you are paying attention to something else. It is always good to have some tools that would issue some alerts even before the resistance or support is hit. Such tools can send text messages on your telephone or simply make a noise. The charting package should not use much of the computer’s resource, so you can work smoothly whatever you do. The charting package should also have a friendly interface, so that you enjoy working with it. It is even better if it has customizing options for backgrounds, channel colors, candlestick colors, trend line etc. Put down in a list what you would like to find in a charting package and compare the list with the available offers. Get the trial versions of these packages and see which one suits you best. Just don’t forget to cancel those demo accounts once you decided to create a live one. If you need to decide upon a Forex Broker, then youn can use the demo accounts and see how the trading execution and platform works. It may sound puzzling for many this demo account opening. Many consider such accounts a lost of time and would rather act on the real market with real money. Sadly, the major part of those who think like thisend up by losing their real money. Demo accounts are free of charge and they are a great oportunity to really test out the brokerage company that brags about being so good. Never take their word, most of them are just out to get zour business. Better try it first and see what it is about. A demo account can help you better understand what are your trading skills and get familiar with notions like execution speed, leverage, spreads and the entire trading platform. A possible scenario which takes place very often is this: if you have a trading account of 300 dollars and you have a losing steak, then the account halts due to lack of capital. That is the good scenario. The bad one is that in case of winning trade, if it didn’t have wiggle room, then the broker liquidates all your positions through a margin call. This means that even your winning trade is liquidated. Therefore, in order to continue, you would deposit again 300 dollars and you’ll find yourself spinning in a circle. Before going into this game of trading, you should make sure that you have some spare capital to put in, an amount that, in case of losing, won’t affect your lifestyle or someone else’s. Don’t use borrowed or emergency set-aside capital to trade on Forex. When you have that spare capital, first try a demo account to make sure you know how it works and what to expect. Two or three months of consistent trading should get you a pretty good picture about how things work. Only then you can go ahead and open the live account. 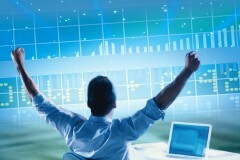 The trading account depends very much on the capital you have. It is like in gaming: losing lives loosen the power of your character. Just the same, losing monez depletes the trading account until a stand-still. This is why it is very important not to lose capital. You’d rather lose an opportunity than lose capital.